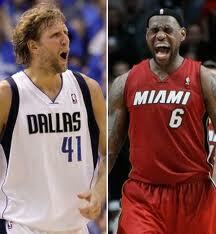 During the NBA Finals, I wrote with great anticipation about the Dallas Mavericks hopefully beating the Miami Heat. My son and I wanted the Mavs to beat the Heat because 1) they knocked our beloved Celtics out of the play-offs and 2) we despised the way Lebron James made a circus out of leaving Cleveland, practically claiming to be the chosen one. Maverick players were getting it done by being demonstrative and touching each other by high-fiving, patting butts, handshakes, etc. I related this to management’s attempt to raise morale as a great thing and that companies need more of it. Now I’d like to talk about Dirk Nowitzki and Lebron James and how they are analogous to jobseekers vying for the same position. No one will stage a great debate as to whether James is better than Nowitzki; James is a dominant, every-coaches-dream player…at least on paper. What I’m going to assert is that if you’re not the best person on paper (Nowitzki), it doesn’t mean you’re not the best one for job. I’m referring to your résumé, which may indicate a lack of certain job-related skills. It may not be the best one submitted for the job, but keep in mind that a résumé doesn’t get the job; the interview does. Although a great résumé helps in getting to the interview, a good one can accomplish this, as well. Let’s go back to James and Nowitzki. On paper James is king, but during the playoffs, Nowitzki ruled. To further the analogy, let’s look at the playoffs as the interview. Interviewers often look for the intangibles in job candidates. They see that the other candidate for a Marketing Manager position, for instance, has the prerequisite skills, while you’re missing a few and not coming across, on paper, as not the strongest candidate (Nowitzki). What’s your plan of action? At the interview demonstrate your enthusiasm for the job and mention your strong personal and transferable skills whenever you can. You show initiative, hustle (another word for work hard) and are willing to dive for every ball. You’re a true leader who inspires your colleagues to do their best. Take every moment to explain your accomplishments and how they raised revenue, saved money, and improved processes at your last job. Quantify your results with numbers, dollars, and percentages. Use the Situation/Task, Action, Result (STAR) formula to tell your stories. Be prepared to answer the tough questions, one of which will be, “Why should we hire you?” or some deviation of this. You can do the job, will do the job, and will fit in, is the foundation for this answer. Rattle off the requirements you meet, not the ones you don’t; talk about your love for the company and all it stands for; and mention how you were respected, not feared, by all your colleagues. Appear confident and unstressed by questions regarding the technical skills you may lack. One of which might be your experience with direct mail. Talk about experiences that required total organizational, follow-through, management, and cool-under-pressure skills. Don’t spend the alloted two minutes answering this question. Do your due diligence: follow up the interview with a thank-you note that reiterates your strong abilities to do the job. Don’t revisit the one area of the position where you lack the experience; rather focus on the ones where you do. Be gracious of the time the employer took interviewing you. Address any potential problem the company has that was raised during the interview; explain in detail how you can help them solve it. Keep in mind the words of Rick Carlisle, the manager of the Mavericks, “Our team is not about individual ability, it’s about collective will, collective grit, collective guts.” Employers look for the intangibles job candidates have, what they can do for the company in the future. If your lack of experience is insurmountable, take pride in the effort you put forth at the interview. It was Nowitzki and his team that beat James and the Heat, despite how the King looked on paper. This entry was posted in Career Search, Interviewing and tagged accomplishments, interviewing, James, Nowitzki, resume, STAR on June 16, 2011 by Things Career Related.